RANGERS are through to this season’s Premiership play-off final after a 2-1 aggregate victory over Hibernian. Stuart McCall’s men were in a good position going into today’s second leg at Easter Road after their 2-0 win on Wednesday night, with Nicky Clark and Kenny Miller finding the net at Ibrox. They certainly needed that cushion as Alan Stubbs’ side threw everything at Cammy Bell’s goal on their home patch with Jason Cummings scoring in injury time. That, however, was too little, too late for Hibs, who now face another season in the Championship while Rangers will prepare to take on Motherwell on Thursday at Ibrox and then next Sunday at Fir Park. McCall switched his formation for this afternoon’s 12noon kick off with Lee McCulloch slotting into defence and Nicky Clark dropping to the bench. This meant the club’s captain joined Marius Zaliukas and Darren McGregor at the back in a 3-5-2 formation with Haris Vuckic partnering Miller in attack. Stubbs also made one change with Dylan McGeough replacing Scott Robertson in the centre of the Hibees’ midfield. With the sun shining down on Leith the Rangers fans were in fine voice even if the club was given under half of its usual allocation. With the other half of the away stand bizarrely empty the 1,500 bluenoses in the ground did their best to get behind their side as the Light Blues endured an early onslaught. After a minute of silence was perfectly observed for the 216 men from the 1st/7th (Leith) Battalion who lost their lives 100 years ago in Britain’s worst rail disaster, at Quintinshill north of Gretna, the home support were off their seats quickly when the action got underway as the ball appeared to hit Dean Shiels’ hand in the box. 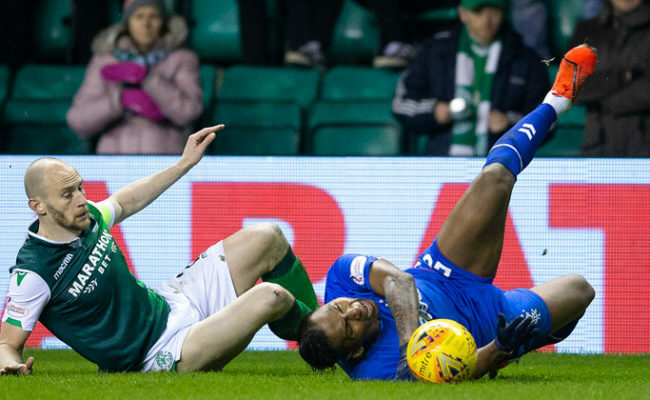 Ref John Beaton let play continue which was the right call. From there Hibs went for the jugular with Liam Fontaine heading over from a Scott Allan corner before Fraser Fyvie launched a low shot from distance which had Cammy Bell diving to his right to make the save. Top scorer Cummings then showed tidy control from 20 yards but his shot to Bell’s left was again held by the Gers number one. In the 10th minute a floated cross was brought down superbly by Liam Craig at the back post. He could have shot but from a tight angle he fired in a cross which Bell got a glove to before McCulloch cleared from the six-yard box. The early pressure was relentless and when Fyvie smashed an into the ground and into the Gers box, Cummings tried to divert the ball goalwards but couldn’t get the power or accuracy to open the scoring. With 20 minutes on the clock Bell’s illuminous yellow kit was already covered in dirt yet Mark Oxley in Hibs’ goal had not made a save. Kenny Miller tried to change that when he found a yard of space 18 yards out but his curler was straight at the big Englishman. 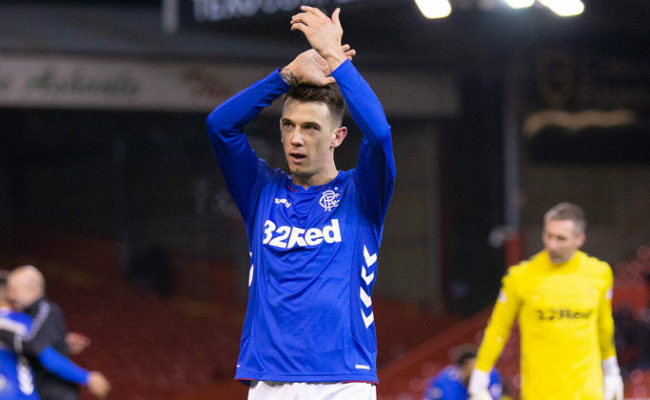 Rangers now, at least, had something to build on and on 26 minutes Vuckic and Foster combined with the latter whipping in a terrific cross which Miller could only head wide. On the half hour mark the travelling Bears would have been relieved the score was goalless while the Hibs supporters were starting to grumble with their players failing to make the most of their terrific start to the game. On 38 minutes they then almost conceded when Vuckic cut in from the right and with his cultured left boot he tried to beat Oxley at his back post. The keeper, however, got his fingertips to the ball to flick it out for a corner. With the clock ticking down Hibs pushed forward once more with Allan getting past Murdoch on the left but his dangerous cross was booted away by Marius Zaliukas. Despite Hibs’ dominance for the majority of the first half, Rangers were still in the driving seat in the tie at the break with their two-goal aggregate advantage. Hibs, however, started the second half just as they did the first and on 54 minutes a cross from Craig was met first time by Malonga but his powerful volley went a foot wide of target. Stubbs now had nothing to lose and he swiftly made his first substitution with striker Farid El Alagui going on for midfielder Liam Craig. On the hour mark Bell was again called into action, this time getting down brilliantly to Malonga’s 20-yard strike which looked to be finding the bottom corner of the net. 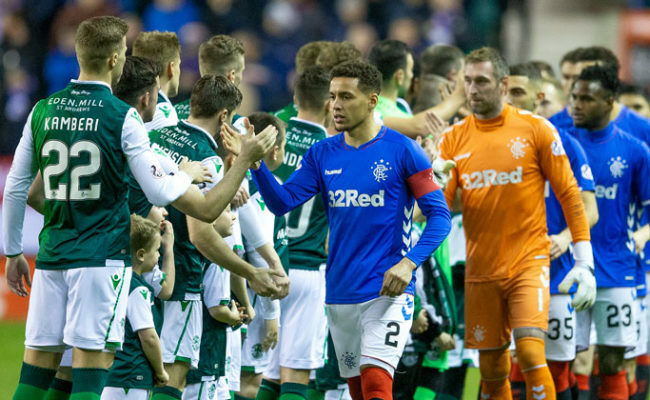 The Rangers fans cranked up the volume in a bid to get their side over the finish line but with 20 minutes to go, plus five minutes of injury time, there was still a lot of football to be played against a Hibs team with fresher legs. With Nicky Clark, Ian Black and Bilel Mohsni going on in the latter stages it was all about discipline for the visitors who had to keep cool heads. Hibs, as expected, kept battling with Cummings scoring with a delightful shot into the opposite top corner with a minute remaining. 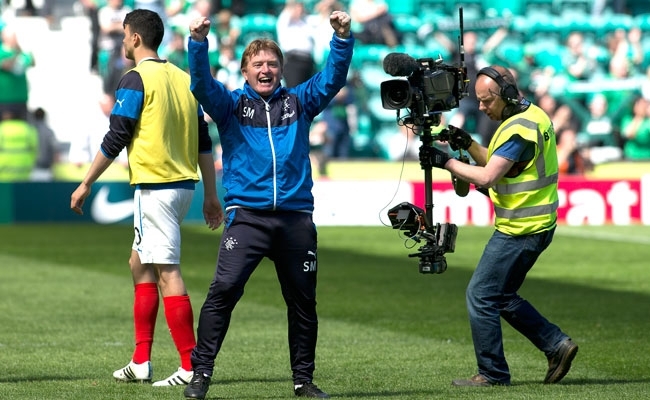 But credit must go to every Rangers player for the way they fought until the final whistle to ensure a passage through to final and a double header against Stuart McCall’s former club, Motherwell.